Every car comes with a set of basic tools for you to use in the event of an emergency. These tools are located in a compartment within your trunk if you drive a SUV or small car, or behind your back seats if you drive a truck or something with a bed. Within this compartment, you will generally find a basic car jack, a wrench, and an extender if you ever need to jack up your vehicle. You should also find a spare tire on most cars located in the trunk of the car, or bolted to the back or underneath the vehicle itself. 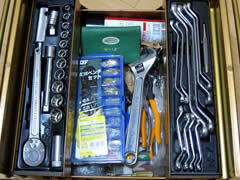 Whenever you buy a vehicle, you should know how to use these tools to perform some basic maintenance on your vehicle. The last thing you want is to be stuck outside in a rainstorm while you are broken down on the side of the road. Here is a basic guide on some do it yourself repairs that you can perform using just the tool kits that come with your car. If you are driving down the road and your tire experiences a blowout, or you notice a flat, do your best to pull over the side of the road to a safe location that is preferably as level as possible. Turn on your blinkers, set the vehicle in park, and apply your emergency-parking break. Safely exit the vehicle and remove the available tools form their compartments. Find two sturdy rocks somewhere along the roadway and place one in front and one behind the tire that needs replacement to prevent it from rolling. Attach the rods together to provide for some leverage and position your jack underneath the frame resting on a solid metal portion that won't bend or break. Begin to the jack the car up so that is gently supporting the vehicle slightly off the ground, but not lifting it up. Using your provided wrench, take the flat side of the tool and pop off the hubcaps if applicable. Then loosen up the lug nuts by turning them counterclockwise one by one, but don't remove them completely just yet. Once they are all pretty loose, jack the tire up a little higher so that it is off the ground. Continue to completely remove the lug nuts and take the damaged tire off the wheel. Finally take the old tire and place it on the wheel. Begin screwing on the lug nuts with your hand, and then use a wrench to tighten them all the way. Lower the car back down to the ground, double check to see if all the lug nuts are in place and the spare is intact, and return all tools to their original location. Open up the hood of the car and locate the battery terminals. If the terminals have caps on top, use one of the provided wrenches to pop off the cap and help you to unscrew the terminals themselves if you can't do it by hand. BE CAUTIOUS not to touch any metal tool to both terminals. This will create a closed circuit of electricity and you could get electrocuted. Remove the old battery and wipe off the terminal if any battery residue remains. Replace the new battery and attached the cables one by one to their color codes location. Replacing your windshield wipers is one of the easiest repairs and may not even require any tools to perform. Purchase new wiper blades that match your make and model of the vehicle so that they can comfortably reach all parts of the windshield. Life the wiper arm up from the windshield?don't worry, it won't break. Unhook the old blades by look for where the metal arm meets the rubber blade. Check for any pins or clips that hold the two together, and make sure that you remove these before making the replacement. Attach the new wiper blade by clipping it back onto the hook and inserting any pin or clip that exists. Push the wiper blade back down onto the hood and test it out to make sure that it works.